How long is the waiting list for a rescued Bernese Mountain Dog? Although we date stamp all adoption application forms, we sort through the list looking for the best family match for the dog based on its needs and requirements. When a dog becomes available, we match the best home for the dog, as opposed to acting on a “first come, first served” basis. Therefore, someone can be on the list for a short while or for many months, depending on the number of incoming dogs and their individual needs. How many dogs does your organization currently have available? Fortunately, we have homes waiting for dogs, as opposed to dogs waiting for homes. Therefore, it’s not a very high number. We hope that it remains low. We are fearful that with the growing popularity of the breed, this number will increase in the future. We are taking action to educate puppy buyers so that we will have fewer unwanted dogs later on. How is a family selected when you find a dog that needs a home? Any candidate family that meets the needs and requirements of a particular dog and who has registered as a candidate family by completing the Adoption Application Form will be notified of a dog in need. When a dog becomes available the Adoption Coordinator goes through the applications and begins to match the best home for the dog. Those families chosen to be prospective good matches will have an opportunity to meet the dog, learn about the dog’s situation, be interviewed by a member of our Rescue team, and have a scheduled home inspection. With our current rate of adoption, we are finding that many who sign up as candidate families wind up taking themselves off the list at a later date because they purchased a puppy, moved out of state, or made other life changes in the meantime. I only want to rescue a young dog, since Bernese Mountain Dogs have short life expectancies. What are the chances that I can rescue a dog two years old or younger? Our most common request for rescue dogs is a two year old, obedience-trained, housebroken, well-mannered dog with good markings. Our least common rescue dog fits this description! Rescue dogs, by definition, are being rescued from a place that is worse than where they are going. That said, the dog could have suffered trauma, been abandoned or surrendered to a shelter. Families interested in rescuing a dog need to remember that they are helping an animal to find a better place in the world, even if it means that animal needs extra TLC. Re-homed dogs, by definition, are finding new homes with the help of their owners who are taking effort in their new placement. These owners might be breeders, or loving families who are in life-crisis. These dogs are typically not traumatized but will need extra love to help them over their grief. The average age of a rescue/re-home dog is between 5 and 7 years old. Rarely, if ever, do we get puppies. I can’t afford to purchase a Bernese Mountain Dog at prices of $700-$1500 a puppy, so I want to rescue. Bernese Mountain Dogs tend to have more health issues than other breeds. These issues can include cancer, dysplasia, entropian, ectropian and bloat. Many of their health issues can be life long and require consistent medical attention. Survey the average owner of a Bernese Mountain Dog and they will tell you that their biggest investment into their family pet or show dog was NOT the puppy fee. We caution anyone who thinks that they are getting an economical deal when rescuing a Bernese Mountain Dog. The current adoption fee is $300 plus any expenses incurred by the individual dog. I heard that Bernese Mountain Dogs are great with kids. I want to rescue one for my children. It’s true that Bernese Mountain Dogs are wonderful with children. Many rescue or re-homing situations are appropriate for families with children. However, some rescued or re-homed dogs are senior, have poor health conditions or have never lived with children. In that case, we would not place a dog with these types of need in a home with younger children. On the flip side, a young, energetic, well-adjusted dog, who had always lived with children in the past, might grow sad without them. In that case, we would do our best to place the dog in like surroundings, therefore finding a home with children. One key thing to remember with any breed of dog is don’t get dogs for your kids. I want to breed a Bernese Mountain Dog because I think it would be fun to have all of those cute little puppies! All rescued or re-homed dogs that we place must be spayed or neutered. We do not support careless or thoughtless breeding of Bernese Mountain Dogs. 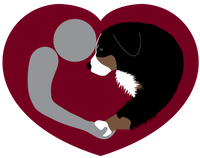 There are plenty of well-educated, experienced breeders of Bernese and we support only those breeders who take a serious interest in their puppies and require a buy-back clause in their puppy contracts. This provides them with life-long responsibility to every dog they bring into this world. I live out of state and don’t have a rescue/re-home group near me. Can I adopt from you? No, unfortunately, we can only place dogs within our boundaries, and those are the city of Bakersfield, north to the California/Oregon border. We need to be close enough to visit and approve the home site. And at this point, we still have homes within our boundaries waiting for dogs.